The title of this page should really be "Our first guitar lesson". 30 years into teaching to students in many different parts of the globe, I have come to realize that the first lesson for my students is also my first lesson. 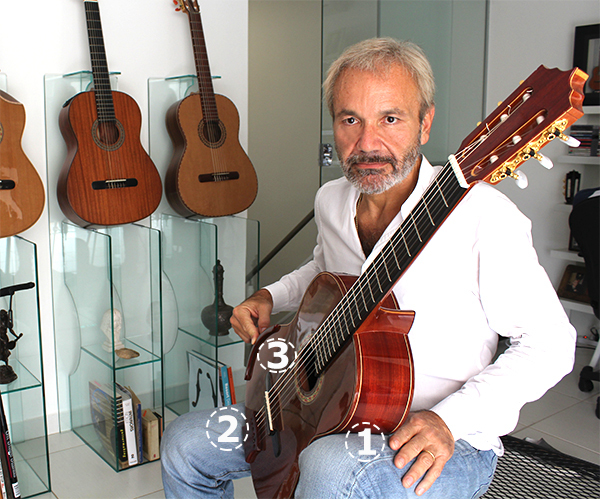 Classical guitar can only be played well. Not playing it well makes it impossible to master and turns the guitar into the most difficult instrument of them all. Before starting to learn our first classic, the classic Romance, let me show you a few basic facts that you ought to know concerning your sitting position and your playing apparatus. A good sitting position is essential to master playing. A faulty sitting position will doom your playing sooner or later. "The guitar must adapt to the body, not the body to the guitar. 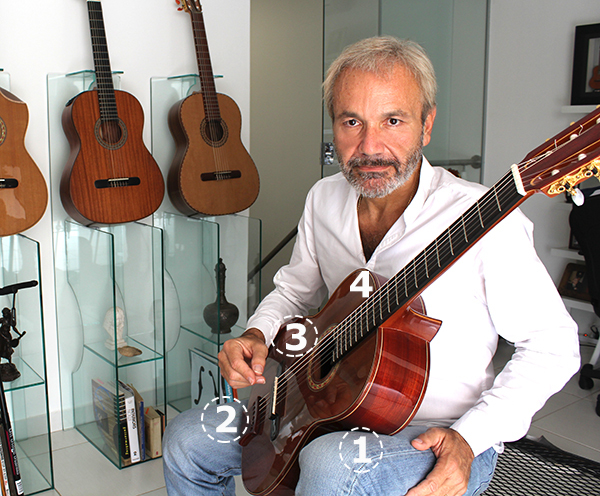 "Each player must take into account his or her unique characteristics and the guitar must adapt to these unique characteristics. In the image below, you can see 3 famous players. Their sitting positions are completely different. Everything in their playing is adapted to their choice of sitting position. Upon close observation, the intelligent player will discover that some positions are A LOT better than others. When I told maestro Carlevaro that I admired Williams' playing, he replied: "He would play a lot better if he used a better sitting position". 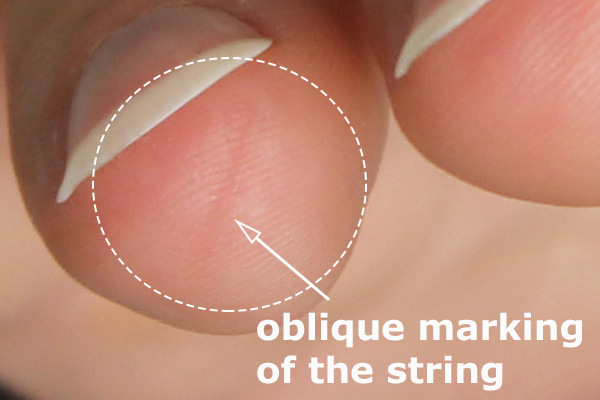 The sitting position will determine the way your hand plucks the strings therefore, your sound quality will be directly connected to your sitting positio. Back pain is one of the most frequent complains of guitarists all over. The problem: "placing both feet forward", this unstable position requires the back to make an enormous effort to maintain the balance". By setting the feet properly, one in front and the other behind, the player will be able to move his whole body by simply pushing on one foot or another. Not applying pressure on either foot will mean stillness. In order to be able to sit with the two feet as shown in the figure to the left, you will have to sit towards the front-right side of the chair (4 legged chair) in order for the right foot to be free to go behind. Out of these five, the left leg is the most important and the most stable. All the other points will adjust according to the left leg. 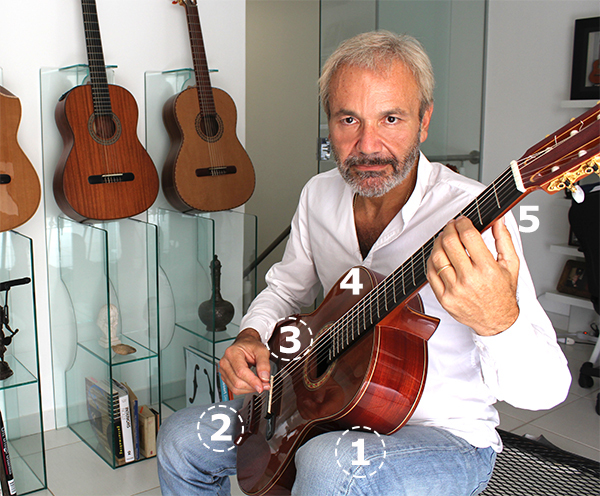 "Only 3 points of contact are necessary to keep the guitar stable". In the 3 pictures above, notice how little I raise my left knee. The left foot is on the footstool (at its lowest position) and my right leg goes back to compensate for the left leg push backward. In an old interview, around 1970, when asked about sitting position, and which one he considered to be the best one, Narciso Yepes, the great Spanish master, answered "the best sitting position is on a big and comfortable sofa". He completed the sentence saying that "it is simply too big to take around the world on a plane and you do not want to be sitting more comfortably than your public". Therefore we can say that the one described above is the best sitting position in a standard chair. Once you found the correct balance and feel like no strain is present in any part of your body (the worst case scenario is that you feel strange, awkward or weird... but no pain should be present whatsoever), you are ready to face the following and most important factor of them all: SOUND production. Your sound. Guitar players produce the sound with the tip of their right Hand fingers (left handed players do the opposite). The logical conclusion is that, depending on how tidy and shaped you keep your nails and depending on the skin of your fingertips, your sound will vary accordingly. Modern professional strings have evolved to a point where minimal changes in these factors will be appreciated in the sound quality projected. Perfect. Now, let us see what we need to do in order to play our first concert piece. For now what we need is tidy nails and fingertips in our right hand and short, extremely short and tidy fingernails and fingertips on our left hand. More sculptural caring and shaping of the right hand nails will only be achievable later (when we know exactly what we sound we can produce). 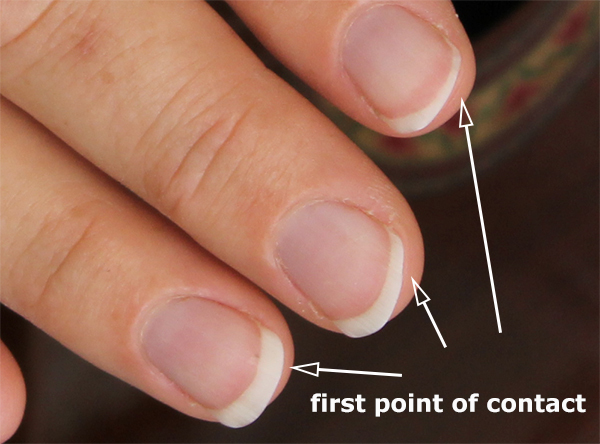 Above I show the point of contact on the tip of the fingertip. The flesh displays a marking. I cannot call this our first free guitar lesson for beginners, because chances are that if you got to this web site, you probably tried to learn how to play before and that did not work, therefore you are not a beginner and, to pretend that guitar teachers give it all out for free is a quite pretentious request. Nevertheless, you will find a lot of information in these pages. GO to your first classic: "Romance >>"